Is there any Word/Writer - LaTeX demonstration document available? I often hear how better the LaTeX is but the comparisons I have found, did not persuade me. Is there something like "showcase document" containing different kind of formatting, formulas etc. available in PDF in versions made from LaTeX and Word/Writer? It would be very useful to have such PDFs, which I could print and visually compare and possibly also show to my boss to see if the difference is so noticeable. I am thinking about creating some of our reports in LYX instead of LO Writer. 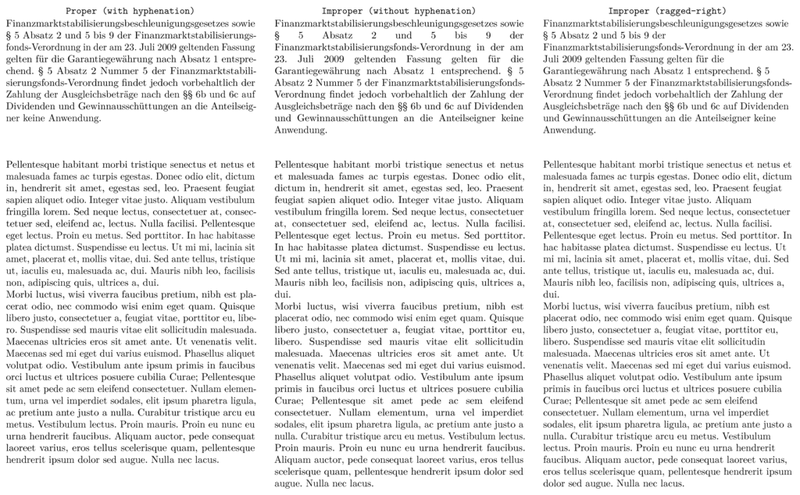 Probably not exactly what your are looking for, but illustrating some typographical points is "The Beauty of LaTeX". Whether you should use Word or LaTeX depends on your project, IMHO. In general, the more complex, the more LaTeX. But you will need to invest some time and effort to get those impressive results in LaTeX, especially if you want or have to fine-tune the output. The Word vs. LaTeX is a recurring discussion also on other Stack Exchange sites, see e.g. Is LaTeX worth learning today? ; LaTeX vs MS word; Do you use TeX for writing your thesis or only for its composition? Not the answer you're looking for? Browse other questions tagged typography msword examples or ask your own question. Do you use TeX for writing your thesis or only for its composition? Are there any tools that convert a table from MS Word to LaTeX tabular format? From Word to LaTeX, how? Are there any guidelines to write a format of a file in a document in LaTeX?